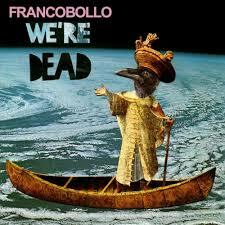 Swedish, London based band Francobollo have released a new single entitled ‘We're Dead’. Another taster of what’s to come from the band’s second full length album - the song discusses addiction to the online world, the current state of the human brain and its qualities in the modern world. Produced by Brit award/Mercury Prize winner Charlie Andrew, and released on his label Square Leg Records, ‘We’re Dead’ is arguably one of Francobollo’s most accessible and direct songs to date. Hinting at our generation’s obsession with our phones and addiction to the online world, frontman Simon Nilsson sings: "We do it when we’re bored, we can’t afford to take the time / Cause everybody knows that you’re supposed to be online (all the time) / Staring at the screen, it’s all we need when nothing’s on, Pretty little bubbles we create to sing our song”. Joyously bustling along fusing quirky guitar lines with its chugging rhythm section, the track builds wonderfully to a pounding crescendo with Nilsson pleading with the listener to: "Open up your eyes, look to the sky - it never ends”. Francobollo released their debut album ‘Long Live Life’ in 2017 to widespread acclaim and support from radio (BBC 6 Music, Radio 1, Radio X, amongst other stations), as well as the likes of NME, DIY, Dork, The Independent, Notion Magazine, The Line Of Best Fit, Clash Magazine and many more. Seamlessly switching from mellow, beautifully constructed melodic instrumentals - into wild, explosive moments of raucous brilliance - there’s a surprise around every corner within Francobollo’s music and songwriting, all executed with an undeniable measure of passion and grit. Francobollo originally met at school in Lund, Sweden — and after moving to London together, they played and recorded as session musicians for bands such as Slow Club, LA Salami and members of Mystery Jets. Talking on their plans for 2018, Simon continued: "Our plan this year is to ﬁnish our second album, start on a third and keeping on releasing music. We've got more shows and festivals booked in across Europe and UK, including our next London headline at Omeara. All about the music baby." 2017 was an exciting and busy year on the road for Francobollo, touring with The Big Moon, Marika Hackman and Coheed & Cambria, as well as playing numerous major showcases and festivals before embarking on a 24-date UK and European headline tour in the Autumn. ‘Long Live Life’ — the band's debut album, along with their thrilling live performances have cemented Francobollo as serious ones to watch as they continue to take great strides and establish themselves as one of the most original, exciting new bands around.